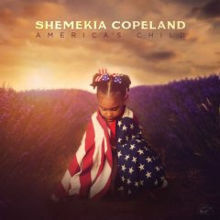 George Graham reviews Shemekia's Copeland's "America's Child"
The great blues tradition has given rise to rock and roll, and even to some extent jazz. The music continues to thrive, with an active scene, but these days most blues performers tend to hew to the conventions in terms of instrumentation, lyrical subjects, etc., with the emotions of the performances being the distinguishing features. In recent years, some alternative rock bands, like the Black Keys, have ventured into blues territory in terms of material, giving a decidedly more electric and raw approach than even the long-time Chicago electric blues school. This week, we have an interesting new album by a blues performer who has made a recording that could be described as a kind of singer-songwriter record, though the original songs were written by others, with the lyrics going well beyond the usual blues topics of infidelity and heartbreak. It’s the new album by Shemekia Copeland called America’s Child. Shemekia Copeland is a second generation blues singer, the daughter of Texas blues great Johnny Clyde Copeland. She emerged with her debut album Turn the Heat Up in 1998, at age 18, and has been recording more or less steadily since then. She has has maintained a non-stop touring schedule, which brought her to our region a few times, to the US troops in Iraq and Kuwait, and also to the White House with B.B. King in 2012 to perform for President Obama. For her new album, Ms. Copeland went to Nashville and worked with songwriters and musicians there. But America’s Child is anything but a country album. Her main collaborator on the project was guitarist, songwriter and producer Will Kimbrough. Guests on the album include John Prine, who contributes a song, Emmylou Harris, Rhiannon Giddens, and another first-rate songwriter Mary Gauthier. Another frequent songwriting contributor was John Hahn. It seems that much of the material was written for this album, though there are some covers of older songs, including one from Ms. Copeland’s father Johnny. With the direction of the songwriting, America’s Child is definitely not your typical blues album, or Nashville one, for that matter. Some of the songs consider contemporary topics like the re-emergence of hate and racism in the Trump age, as well as a song celebrating diversity. But there are also some songs on more conventional topics like relationships, and the John Prine composition, which is typically quirky lyrically. Ms. Copeland became a mother last year, so there are a couple of relevant songs, considering the kind of world her son was being brought into, and the album ends with a lullaby. The production is crisp and the musicianship first-rate. The band includes Kimbrough on the guitars, bassist Lex Price and the solid drumming of Pete Abbott. Ms. Copeland is a versatile vocalist who adapts well to the different lyrical directions of the songs, and she does have a chance here and there to belt out the blues, which she can do so powerfully. Shemekia Copeland’s new album America’s Child is an excellent recording by a versatile blues-based artist. While maintaining a blues ambiance, the album is lot more eclectic than typical for a blues record. Some of the songs touch on contemporary social commentary. And the album having been recorded in Nashville, does impart a different feeling. While Ms Copeland did not write the material, the songwriters, mostly creating music specifically for the record, have some up with first-rate material which Ms. Copeland delivers with her wide vocal range, from slow soul ballad style to energetic electric blues. Our grade for audio quality is close to an “A.” The mix has good clarity, the vocals are clean, warm and unfettered by effects, and the band’s instrumental sound is punchy. Though best-known as one of the rising stars of the blues, Shemekia Copeland proves her versatility and definite level of class on her new release America’s Child.